The dog and rabbit Chinese zodiac signs can share a great love compatibility. Will their differences contribute to this? Or will their differences work against them? Will their similarities cause any problems? Will the dog and rabbit in love have to work hard in order to have a long lasting successful relationship? The Chinese rabbit sign has a tendency to be shy and reserved. Because of this they will sometimes be treated as a pushover by other stronger personalities. The dog is honorable and will not take advantage of the rabbit or their shyness. They usually have issues when it comes to trusting others. In a dog and the rabbit relationship, both have natures of trust and admiration. The dog and rabbit in love are both faithful and devoted and make their partners feel secure. Both will be able to form a close and intense romantic relationship. When the dog starts dating the rabbit, they will have a great time. Chinese horoscope compatibility forecasts that a breakup is just out of question! The rabbit will not give the dog any reason for suspicion, thus making them feel more secure. They depend on their close loved ones for emotional encouragement. Without their support, the rabbit man or woman can become off balance. They see things in a subjective way. The male or female rabbit is charismatic and gracious, which is appreciated by their partner. They depend on their partner’s encouragement and rational judgment of any situations that might be potentially problematic. They might have issues separating fantasy from reality. They could also be subject to having some foolish concerns at times. The dog man or woman can also have issues with foolish concerns. However, they have a lot of strength and will be able to reassure their lover. They are honest and have an easy-going nature. The rabbit will have a tender and caring attitude that will help the dog alleviate their anxieties. The male or female dog will always be devoted to their lover, even if they are not in the best mood. They make their partner feel safe. If there is something bothering them, the rabbit will be sure to be aware of it. They will tend to be more positive. In the dog-rabbit marriage, both can be satisfying and contented together. They both will make requests of each other, but they will not be unreasonable. These two should be able to form a successful sexual relationship long term even in bed. The dog-rabbit soulmates will get together for things that seem to serve their goals. Both these Chinese zodiac signs will cooperate with each other, and neither will mind if the other needs some time alone to express their freedom. The rabbit enjoys material things and will desire things that are finer. The dog does not care as much about material things. In the dog and rabbit friendship, both will be accepting of each other. The two will see each other as being original instead of just having irritating traits. They will enjoy a quiet life. Their life together might not necessarily be exciting, but they will be happy together. A dog wife and a rabbit husband will have to be careful about becoming depressed. Both will have a tendency to focus on the more pessimistic things. They will still get along nicely. They encourage each other. Both have a dutiful nature. According to Chinese compatibility, a dog husband and rabbit wife are likely to spend time working together doing things like charity work. 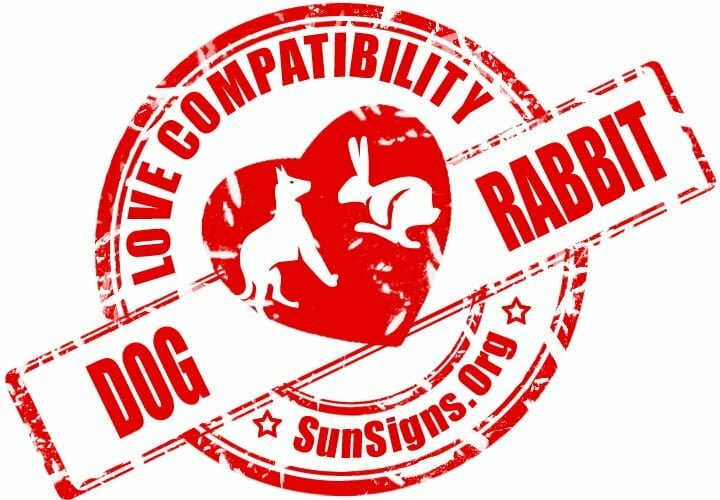 Dog & Rabbit Chinese Horoscope Compatibility Rated 4 Hearts!